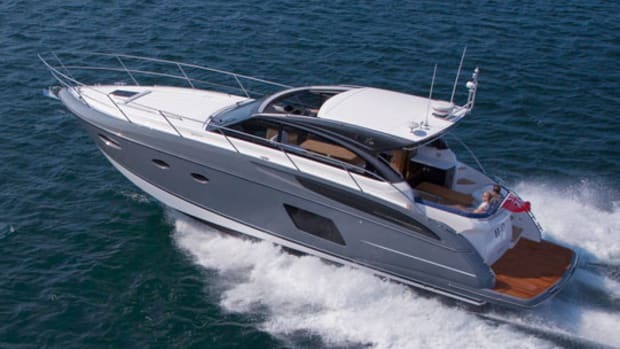 Power & Motoryacht's boat test of the Vicem 107. 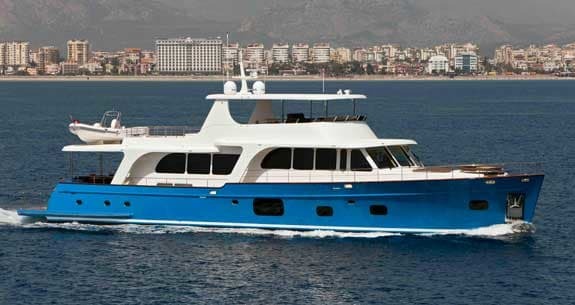 Vicem’s new flagship—the 107 Cruiser—provides blissful refuge from Turkey’s brutal summer heat. My first trip to Turkey last summer was full of surprises. First there was the heat. When I walked out of the airport, it gobsmacked me. I asked my driver just how hot it was, and he replied offhandedly, “Oh it’s under 40—probably 39.” My addled brain managed to make the conversion from Celsius to Fahrenheit: 102 degrees, and it felt like it. More surprises followed. I learned that although it’s only about the size of Texas, Turkey has more than double the population, and it’s one that encompasses a wide range of ethnic groups and religions. Yet unlike its neighbors, Turkey is unabashedly secular, a modern constitutional democracy that is a model of tolerance. You see everything here from short shorts to burkas, and no one seems to care. Turkey’s also industrious. 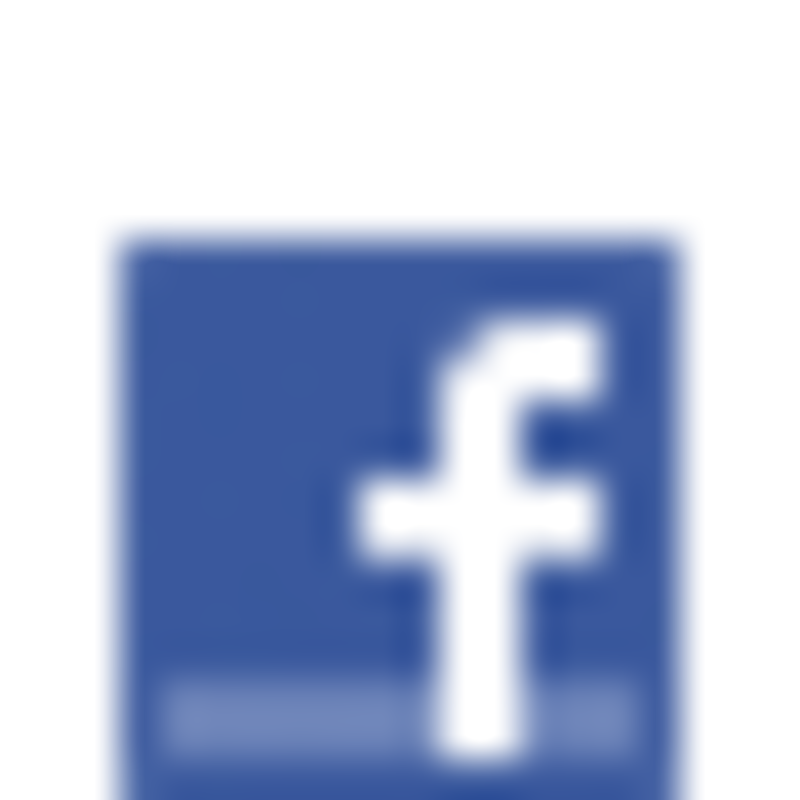 It’s a hub of international banking, petrochemicals, and mining, and in 2008 it built more cars than Italy and ranked fourth in the world in shipbuilding, the business which had brought me here. Well, not ships exactly. 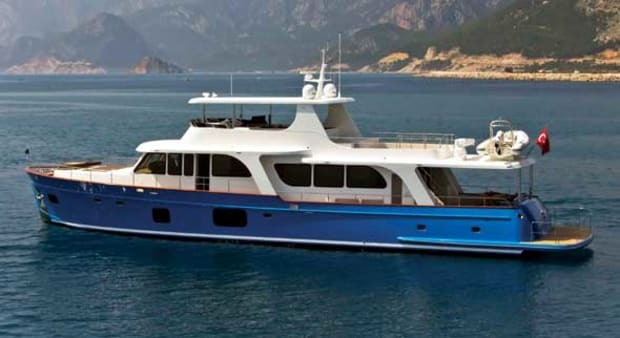 I’d come to visit Vicem, Turkey’s largest and best-known pleasureboat builder. I was already familiar with its Classic line, a collection of cold-molded, Down East-style boats that are renowned for their superb joinery. 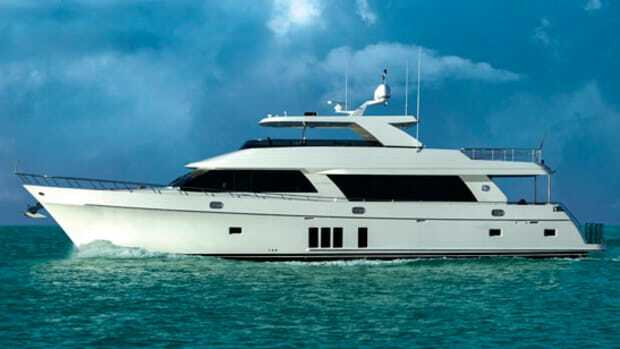 But I was in for yet another surprise: For while it still builds those boats, Vicem is shifting its emphasis to larger, semi- and fully custom yachts. 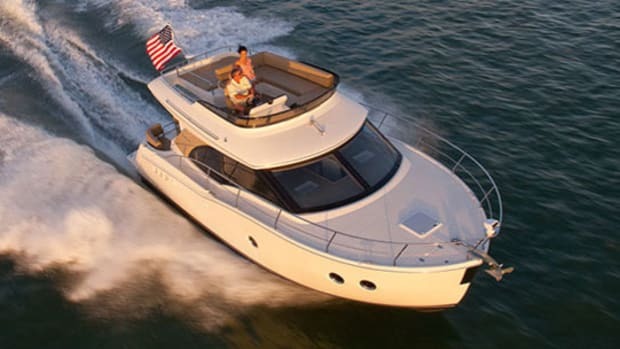 (Actually, the company has always been willing to modify its vessels to suit owners’ tastes.) I had been invited to come see the first example of this new focus, the 107 Cruiser. I met the boat in Bodrum, which is in the south on the Aegean Sea, and the first thing that caught my eye was Moni’s decidedly conservative profile. Indeed, surrounded by Homer’s mythic “wine-dark sea,” an area often frequented by swoopy megayachts, the 107 looked a bit of out of place. With her upright, angular superstructure and near-plumb bow, she is salty and handsome enough to look at home in any Maine harbor. 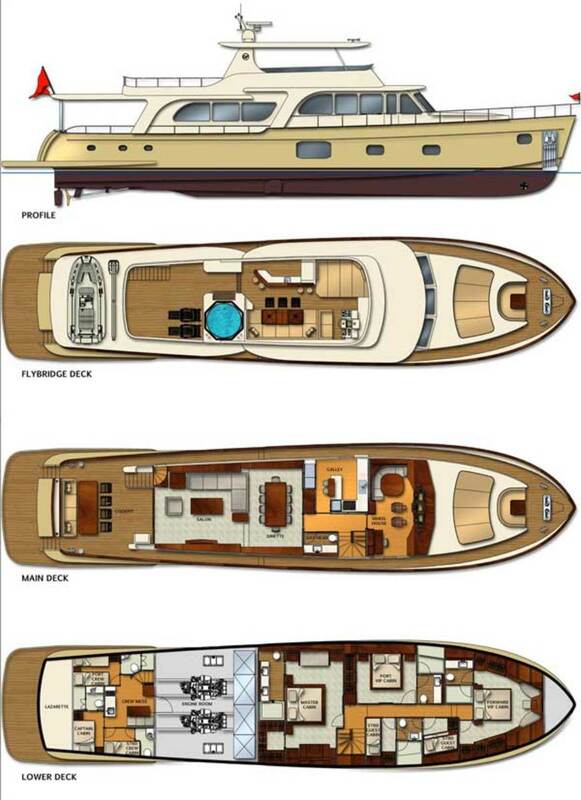 Her semidisplacement hullform is perfectly consistent with her businesslike appearance. 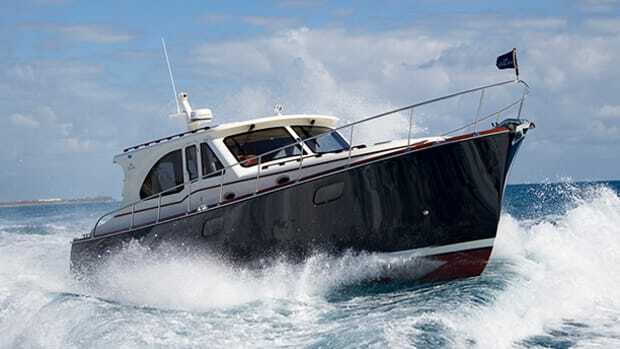 Although a misaligned propshaft precluded a meaningful sea trial, builder-supplied test results indicate a top speed of just under 20 knots and a cruising speed of 15.5 knots (half load) while burning 119.4 gallons per hour. 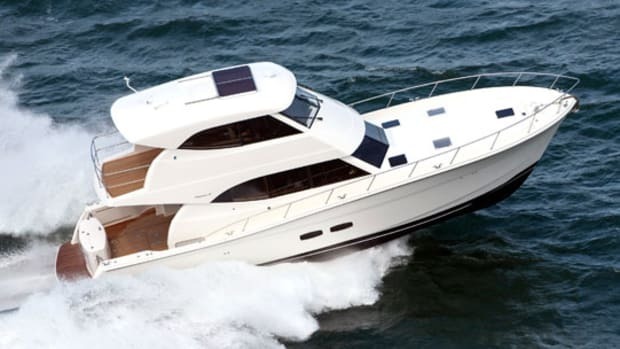 I was able to measure sound levels at that speed: a modest 68 decibels in the saloon and 71 decibels in the midship master just forward of the engine room. 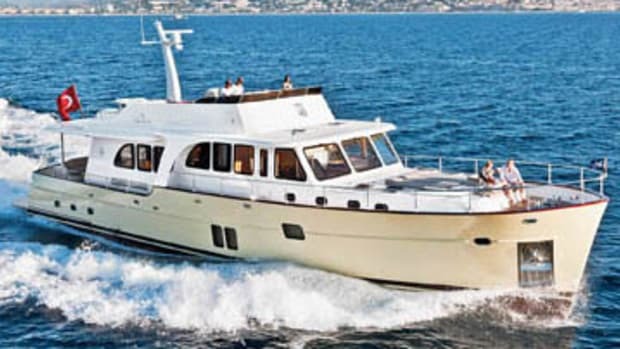 The 107 is now the flagship of Vicem’s Cruiser line, which also includes a 78 and a 92. 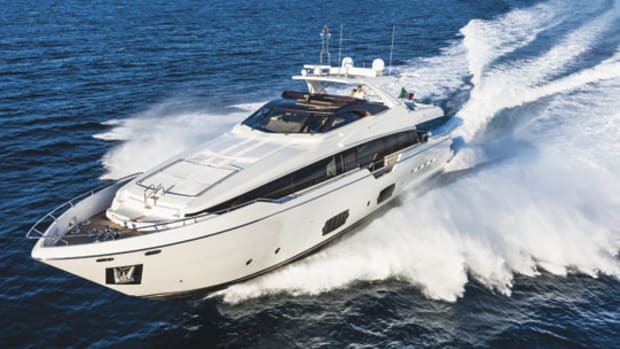 Moreover, because the company’s new and separate Vulcan line of megayachts employs a conventional cored-FRP methodology, the 107 is the largest Vicem to be built using cold-molded construction. Moni’s errant propshaft highlighted one advantage of cold molding: insulation. Not only were her decibel readings low, but the increased vibration due to the problematic shaft was audibly undetectable and barely sensible through my feet. And although the best speed we could make was around 15 knots, I fancied I could detect the special solidity that cold molding creates. Cold molding has another advantage that’s not so discernible. The 107 was originally planned as a 97, but as construction started, it was determined that the engine room and VIP needed to be a bit larger. With cold molding this meant simply inserting a few more frames, where with a conventional FRP layup it would have required extensive reworking—or perhaps even scrapping—of the mold. But it’s easy for a builder to get carried away with wood to the point that interior spaces become dark and claustrophobic, even with Moni’s relatively light anigre. Near-7-foot headroom and numerous large windows preclude that from happening here. From the large saloon to the separate midship dining room, to the portside galley and forward helm, everything on the main deck is bright and airy. Conversely, the cockpit, while open on three sides, is completely shaded by the bridge overhang, where the RIB is stowed. Sunbathers needn’t fret however as there is a big sunning area on the flying bridge, just abaft the hot tub, which is also exposed, and there’s a marvelous semicircular settee in the bow, complete with dining table, lounges, and the best view onboard. 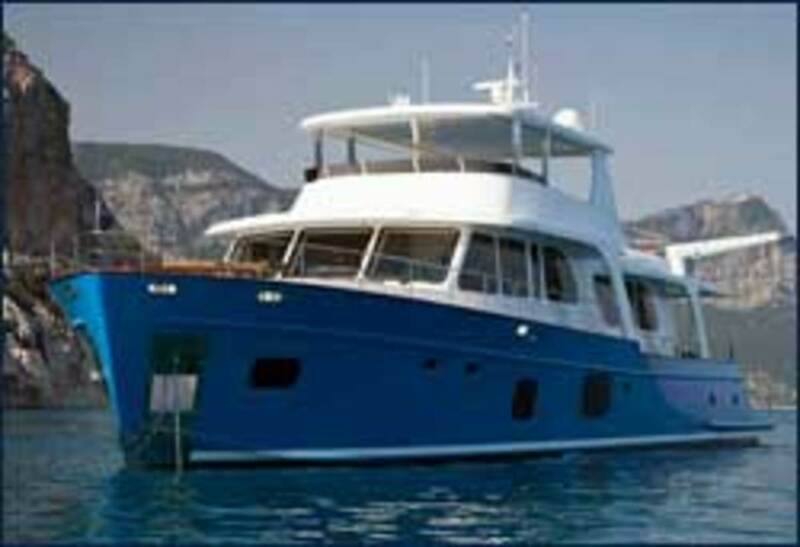 Much thought has gone into the lower-deck accommodations plan, but keep in mind that the 107 is a true semi-custom yacht. 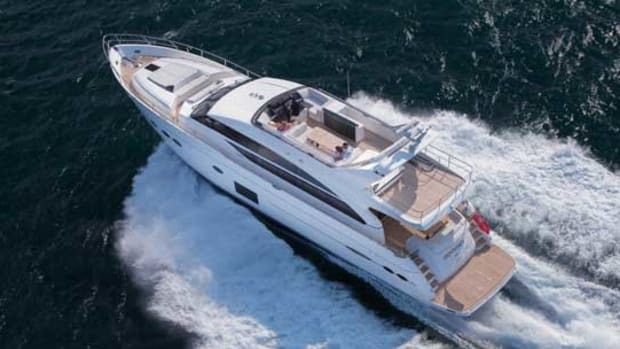 Moni has been laid out for chartering, which explains her arrangement: a midship master, forward and port-side VIP cabins—all with en suite facilities—and two starboard guest cabins (each with bunks) that share a head. Accommodations for the captain (who gets his own stateroom) and three crewmembers (in two cabins), along with a crew mess, are clustered between the large lazarette and engine room, a design that ensures privacy for the owner/charterer and guests. Alternative accommodation plans are limited only by your imagination and budget. As we were returning to the dock in Bodrum, I asked my host to explain the derivation of the yacht’s name. He told me that in Lazca, a Turkish dialect, “moni” is an iconic symbol that wards off evil. It must work. 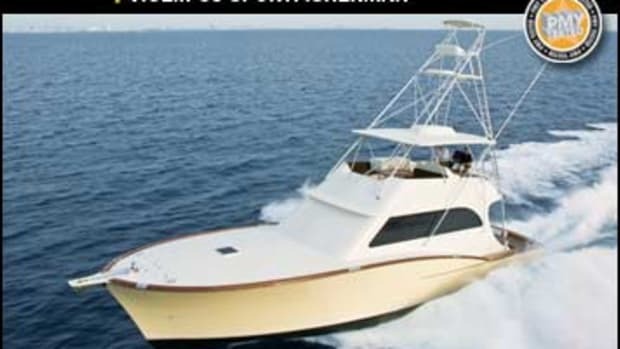 Being on this beautiful yacht in the very waters immortalized by Homer, I never once thought of the heat. Until I stepped back onto the dock. 690 gal. fuel and 128 gal. water.